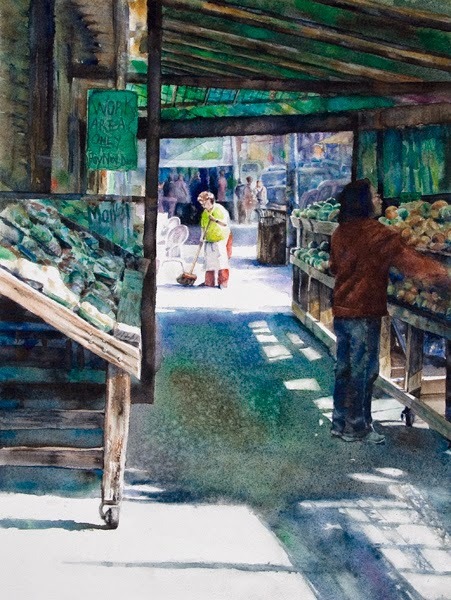 Peggi Habets Studio: New Pittsburgh Painting: "Clean Sweep"
New Pittsburgh Painting: "Clean Sweep"
My collection of Pittsburgh paintings include my latest watercolor, "Clean Sweep". The scene takes place in the historic Strip district of Pittsburgh, early in the morning, where merchants and produce sellers are busy preparing for the morning rush. I added the image of a woman sweeping because, to me, it signifies pride, hard work, and hope. In my mind, sweeping also is symbolic for a fresh start.